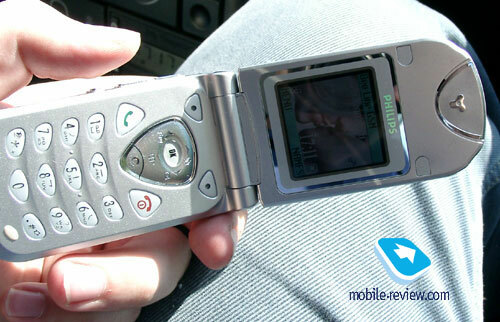 Philips 630 is the second ODM-phone made by Cellon International. The first one is Philips 330, which will be available in the shops in a day or two in Russia. 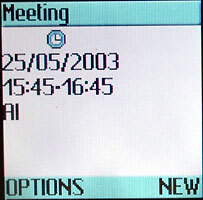 In contrast to the 330, which is based on the same platform as other Philips’s predecessors, the new clamshell phone has a new realization of both hardware and software. 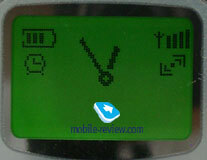 It is one of the reasons, why you could find new functions and new menu structure in this handset. 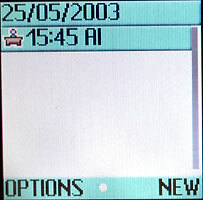 Menu design, icons for messages and other cosmetic trickles makes the new menu similar to other models manufactured by Philips. 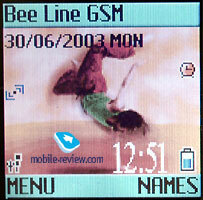 Due to combination of different developments the phone became very unusual, not typical to other models in its class. We can’t say that Philips 630 is the best phone in its class, but it is very close to it, taking into account its price and quality. 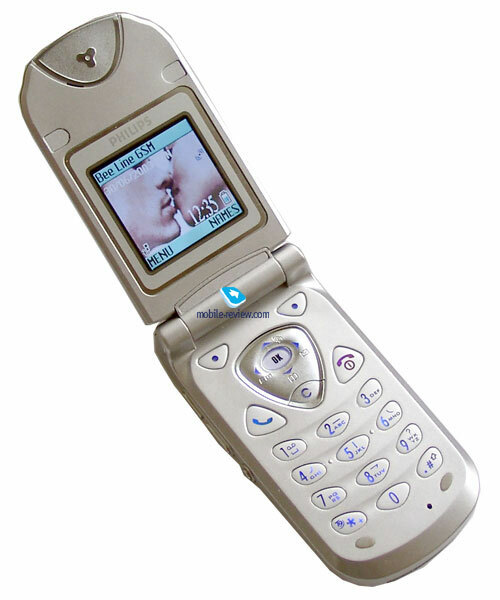 Design of the 630 is similar to many other clamshell phone. It is not striking. Usual design is a disadvantage of the fashion phone, but it is better to consider this phone as a handset, which you use every day just because you need it, not to stand out with a help of it. 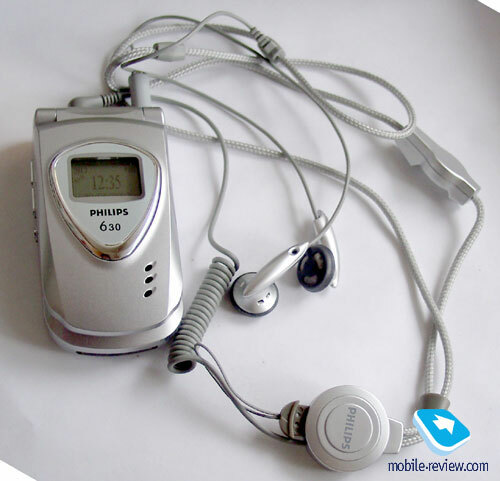 Philips 630 is produced in several colors, the simplest one is silver. Red and blue phones also will be available in Russian market. They are more attractive. 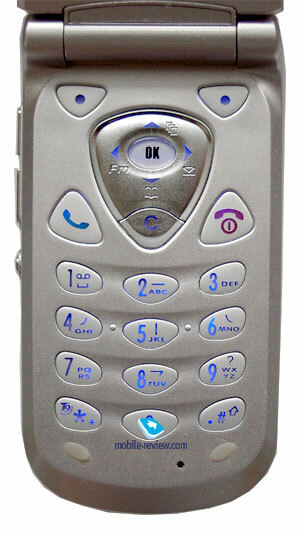 Silver rim around the screen and silver insertions on the phone sides and antenna remain in each kind of phone without changes. Silver color is universal. It will fit both men and women. The same we can say about blue color, though may be ladies will like it more. Red modifications were produced specially for women. The new handset is a little bit thick. It measures 83 x 43 x 21,8 mm and weighs 78 g, what is comparable to the phones of other manufacturers. You can comfortably wear the phone is the pocket of your jeans, shirt or coat. Holes of the loudspeaker are seen on the external side of the phone. It was done to make polyphonic ringer louder. 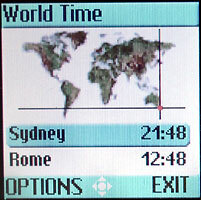 An external screen has a resolution of 80x49 pixels. 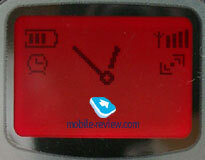 One can see analogue or digital clock and date on it in the standby mode. It is possible to change a color of the backlighting of the external screen (red, dark, blue, green violet, orange, blue, and pink). Different colors are not visible in the sunny day outside but the information is clear, because the display is monochromic. 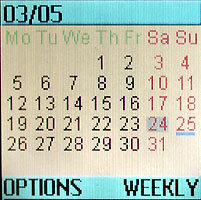 Different events, for example, icons of new incoming message or event are displayed on this display too. 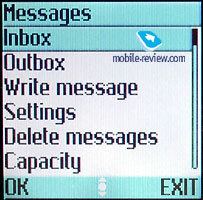 Two volume keys and a separate key for system messages are positioned on the left-hand side of the phone. 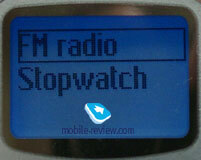 It allows controlling FM-radio, calling a list of saved stations and moving between them. You can switch on/off the radio with a help of this key too. But to call list of stations once again one should firstly switch off the radio, otherwise, you couldn’t do it. 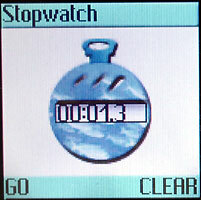 Stopwatch also can be displayed on the external screen. It is the first phone with such feature. 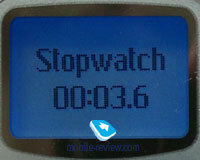 Just choose a necessary function (stopwatch or radio) even without opening a phone. It is very convenient. A strap hole and a handsfree connector (portable headset is included in the standard kit) are placed on the top of the phone. A system connector is positioned on the bottom side of the handset. Charger is connected to the system connector as well. The battery is built-in a rear cover of the phone. It has a small backlash, which doesn’t influence the phone’s work. 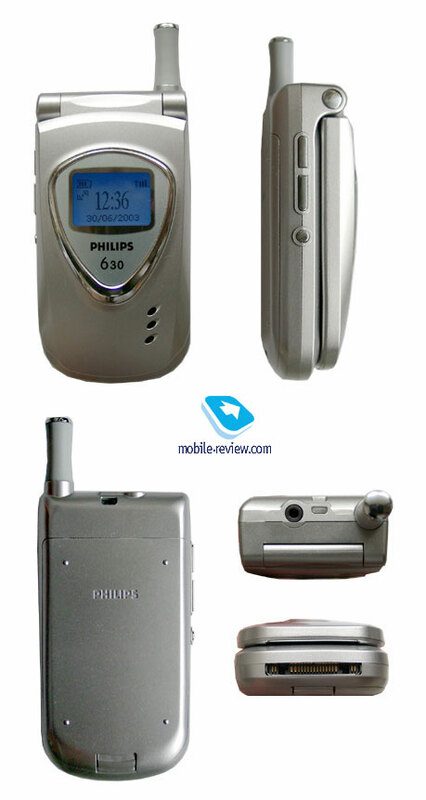 Philips 630 is equipped with a Li-Ion battery of 560 mAh capacity. According to the manufacturer it could provide up to 200 hours of standby time and up to 2 hours and 45 minutes of talking time. 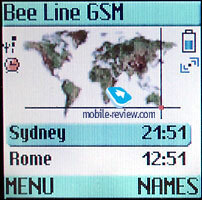 In reality (Beeline network, Moscow) the phone worked about 4 days in case of active using (up to 2 hours of listening to the radio, 45 minutes of talking and 30 minutes of using other applications). Time of full re-charging is about 2 hours. As an extra battery you can purchase a battery of increased capacity (900 mAh, Li-Ion). It will double operating time of the phone. Power consumption of this model with this battery is one of the smallest. When you hold the phone in hands, it creaks a little bit because of plastic. Some will be irritated by this sound, others won’t notice it. It’s easy to open the phone by one hand. The angle is about 25 degrees. During the conversation this clamshell handset is very comfortable. Lower part is situated closely to a cheek. When you open the phone, you will rather large internal screen. 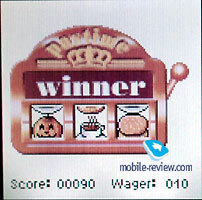 It supports up to 4096 colors. 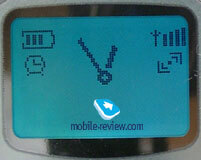 As the phone has an STN display, the information displayed on it is not visible under the sun. 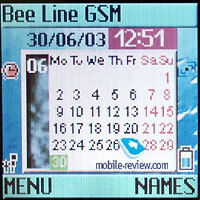 The resolution of the screen is 128x128 pixels (28x28 mm), what allows to display up to 5 text lines and 3 service lines. Color rendering and picture are not bad, as for me they are better than on the similar displays from Nokia (in case of the same number of colors and resolution). Keys are made of plastic, they are smaller than average and placed deep in the case. The keypad is rather convenient, but sometimes there are problems with a navigation key. It is not always easy to press it to the left. The navigation is 4-directional. 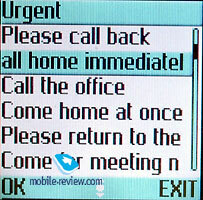 It gives quick access to such menus as radio, phonebook, messages and call list. It is logical that navigation key has OK key inside it. C key is placed very closely to navigation key, but there are no problems with its using. 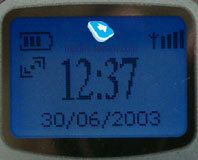 The keypad has a blue backlighting, displayed characters are small and not always visible. Menu structure is not typical for the phones from Philips. There are 8 icons (3 rows) in the main menu. It is possible to move between them with a help of shortcut numbers, but quick navigation doesn’t work in submenus, which look like lists of items. But you can assign alphanumerical keys to different functions, besides you can use voice commands. Let’s overview the main capabilities of the phone. Phonebook. Up to 300 phone numbers can be stored in the phone memory. Up to 3 phone numbers can be added to each name. You can choose a phone number displayed first in the list of the phonebook by default (icon near the name). To view other phone numbers you should see details of the name. 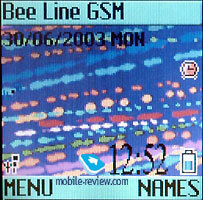 Both phone numbers from the phone memory and SIM-card are displayed in the total list. 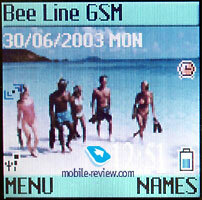 Phone numbers from SIM-card memory are marked by a special icon. There is a search by first letter and a special search by a part of the name. There are several caller groups in the phone. You can set a special ringing tone for each of them. Messages. Up to 100 messages are stored in the phone memory. 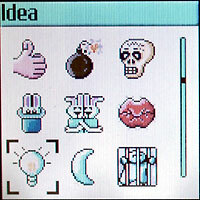 There are 10 templates and a set of pre-installed groups of messages. The phone supports predictive text input T9, so, it is very easy to input messages. It is very convenient to choose addresses to send messages. You can choose several addresses at once. It’s a little bit strange that you can add an icon only in the very end (after you wrote the message and chose an address). It’s not logical. 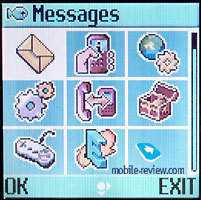 Set of icons is standard for the phones manufactured by Philips. The choice is great and al pictures are amazing. Profiles. 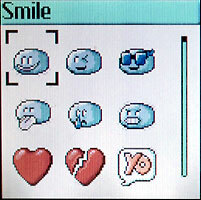 There are 5 profiles in the phone. You can change all settings for each one on the contrast to other phones from Philips. The realization of this function is very convenient. Call divert. Everything is simple. Settings. 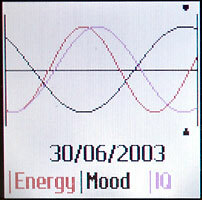 You can adjust volume of the ringing tone, choose one of the 18-th ringing tones. 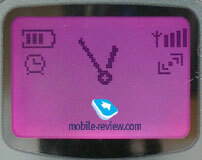 Settings of the external screen can be adjusted here too (color of the backlighting, wallpaper). 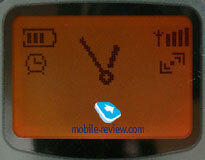 It is also possible to choose one of the 4 pictures, view of the calendar or world time function for internal screen. There is a black-list of phone numbers. This function allows to cut off undesirable phone numbers. Instruments. 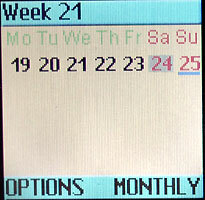 A calendar in the organizer has weekly and monthly views. Only two kinds of events can be added (reminder and meeting). Each event can be once or repeat several times. Past events can be automatically deleted. Up to 30 messages are stored in the phone memory. The number is not large, but users of this class doubtly need more. 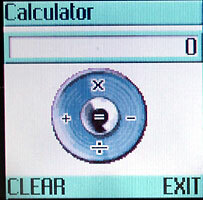 The calculator is very convenient. Fun. 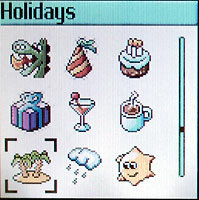 FM-radio is placed in this menu. Standard delivery kit includes stereo headphones, which provide sufficient quality. Sometimes there are interference in the city. The radio loses to Nokia’s phones. There are no control keys on the headset. To answer a call or control radio you should use a phone. 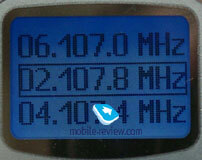 It is possible to switch on/off radio without opening the phone, stations can be also chosen in the close mode. Automatic search is available when you choose radio stations. When you save the station, the phone remembers its frequency. If you change the name of the station, you won’t see it frequency. Games. 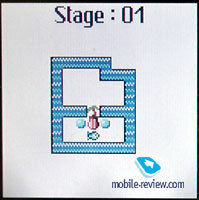 There are three games in the phone: Reflexes, Smartmove, LuckyStar. 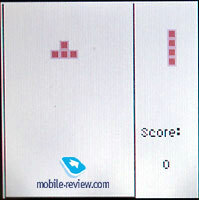 The first game is a classical Tetris, the mission in the second one is to move balls to their palces, the third one is a slot-machine simulator. WAP. 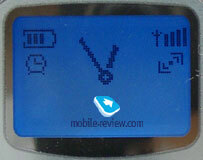 It’s not very expensive to view wap-resources with a help of this phone, because it supports GPRS. There are no other ways to use GPRS here, because IrDA is absent, cable is not a reasonable purchase. Reception quality is rather good. The sound is nice and pure. 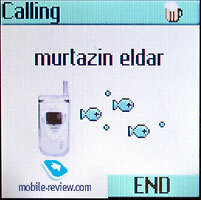 The phone has a high volume of the ringer, which is heard in all conditons. Choice of melodies is not large, but you can choose new MIDI-files. Vibrating alert is strong. Philips 630 will be available in August. The price will be about 225 USD. The phone has many capabilities and it is better to consider it as a phone for every day use than a fashion phone. We think that this phone is one of the most successful handsets among last phones from Philips. It has a balanced set of features, good realization of main capabilities, long operating time. The phone will firstly be mostly interesting for young people and gentlemen. Women is not its target group.